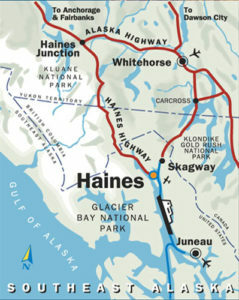 Haines is located on the shores of the northern Lynn Canal, the deepest, longest fjord in North America. Surrounded by snow-capped mountains and hanging glaciers, Haines is truely in the most scenic setting one could imagine for any destination in Alaska. Just north of Juneau and a little south of Skagway, Haines is only 40 miles from the US/Canadian border and is accessible by road, air and water. By Air: My recommendation is to find your way to Juneau via Alaskan Airlines, and if continuing by air, I prefer Alaska Seaplanes to complete your journey from Juneau to Haines. Otherwise, enjoy the ferry from Juneau, coming by water. We had an amazing time staying at Sucasa. We mostly dealt with the owner of the house who went out of his way to help us out and give us insight into local attractions and restaurants. The studio had everything we expected and is situated on a beautiful forested property with incredible views from the beach of Rainbow Glacier. Even saw the local moose and her babies. Highly recommend! We had a great time here! The check-in was easy. The place was exactly as described, with all the amenities one could need. Tom and Carols description are extremely representative of their accommodations. They are kind, helpful, hosts. We even saw them when out and both greeted us and provided us with better bear watching tips. We had a great time at Su Casa, it felt like home. Sitting on the back deck is a MUST! I have never seen such an incredible view. Thank you for your kindness and opening up your home to us. What a wonderful place with great hosts. Will defiantly be back to stay and visit this peace of paradise. Thank you for a great stay! The apartment is perfect!!! Comfy, clean, cozy, with beautiful views! I especially enjoyed watching the moose out the front window and listening to the eagles converse while sitting on the back deck. Tom & Carolyn were friendly and gracious hosts! They even invited me to tag along to see a presentation on mountain goats and grizzly bear habitats that I found quite interesting. They are well acquainted with the area and gave me several suggestions for places to visit. I highly recommend a stay a SuCasa! Pictures do not do justice of the beauty of the location. Ideal setting for the nature lovers who want to get away from the urban "noise". Remote yet still close enough to town. Very well appointed with the little comforts of home. Your host go out of their way to make you feel welcome. What a fantastic house! Views from the beach are awesome! We have felt like home staying here. All amenities you can ask, in the middle of a beatiful wood. Su Casa is a well appointed suite. The kitchen is well stocked with good cookware and dishes. I very much appreciated the spices, oils, etc. The view from Tom and Carolyn’s deck is amazing and the proximity of the beach brings spectacular views within steps of Su Casa. Great place. Our stay lived up to the many excellent reviews I had seen. Keep up the good work. Would stay again. Several good photo op's on drive to house. So, did not mind that it's not in town. Wonderful, adorable place in a beautiful location. Great hosts!